We can easily get into a frame of mind in which because we are angry at the injustice that we have seen, that we are entirely justified, in every sense, in how we respond to that wrong. Cardinal Burke's approach to the document is distinctly different to the lay, angry Catholic blogger. He is being criticised, may I suggest, because his response is humble, measured, deferential, meek, legal, proportioned, Christian and, for a man in his particular rank, very prudent. He is not pouring petrol onto the fire. He is pouring water. Nowhere in the article he has penned for the National Catholic Register can it be inferred, that Cardinal Burke believes Amoris Laetitia to have added anything of great value or weight to the Church's proclamation of the Gospel. It can almost certainly be inferred that it adds nothing to the Church's teachings. 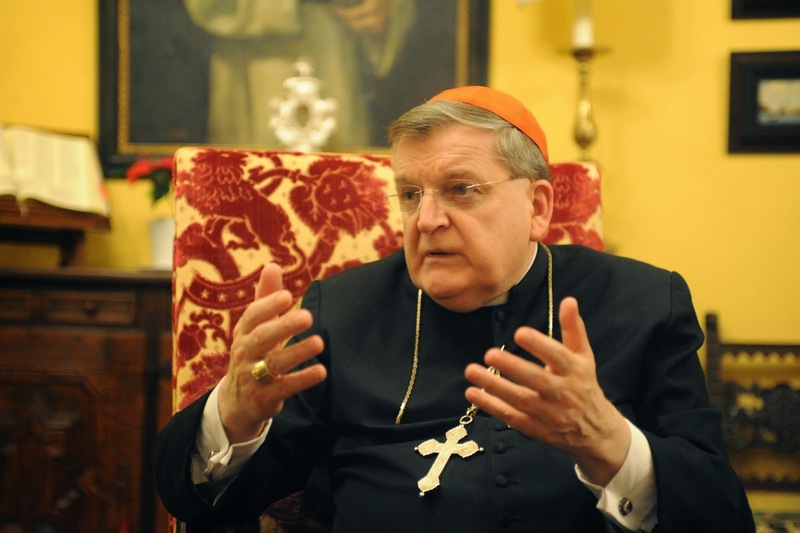 Cardinal Burke is looking at Amoris Laetitia from a legal perspective. He is, after all, the former Apostolic Signatura. He knows his canon law. His assessment is that the Pope's exhortation is, as a leading Prelate, important and worthy of note. His assessment is that, 'There is nothing to see here.' Cardinal Burke is saying that, in terms of the Church's teachings and in terms of the Church's pastoral practise, Amoris Laetitia is 260 pages of irrelevant. According to Fr.Timothy Radcliffe (letter in The Times 13 April 2016), the Pope has "done something far bolder than changing the rules, he invites us to go beyond understanding the moral life primarily as obedience to rules." All things to all men. Whatever. If he didn't refute the document's erroneous teachings, he's just as bad as the rest of the cardinals who support it because as a shepherd it is his job to guide the sheep toward heaven. He failed, big time. Who knows, maybe they threatened him or his family. But you know, Bonester, I'm already personally done with the whole Vatican 2 church which has become to me nothing more than an NGO with a steeple on top. "How can it be possible that an official document promulgated by the "pope", in full consultation with the bishops sitting in synod for two years, and will be implemented by every diocesan bishop in the world in the administration of their dioceses in the matters in which it pertains is not Magisterial? The only way is if the authority that promulgated it doesn't have the authority to promulgate it. That is, he isn't really the pope. The anti-sedevacantist defenders of Bergoglio have, I think, stretched their supreme dogma of anti-sedevacantism too thinly. This document is clearly intended to teach the faithful and to serve as a foundation for the bishops in shepherding their flocks. And a man, who has been stripped of all authority other than a title, is merely declaring it "inoperative"? " It is a great relief to know that every faithful, stalwart and prudent prelate has heard (discerned) the urgent call to arms, taking the lead. These true "soldiers for Christ" are ready to leave all, suffer all, die to every personal consideration and delicacy in order to protect the Church and the souls under their care. Thank God that we can depend on our leadership to "man up" and fulfill their promises to lead the "resistance" against this real and very grave threat to the Faith. The Lord admished us to "turn the other cheek" personally not to turn the other way when the Truth and praxis are under attack. "We all know MANY priests”, he (Cardinal Schoenborn) said, who admit remarried divorcees to Holy Communion “without discussing or asking, and that’s a fact.” He added that it is “difficult to handle for the bishop,” and said he was “very happy” that the Pope in the document takes up the controversial approach he has adopted in Vienna. This involves what he called “five attentions” made to remarried divorcees: a series of five questions the priest must ask to see how merciful and correctly they have behaved before, it can be inferred, they are able to receive Holy Communion. They include how they treat the children of their first marriages, how they treated their abandoned spouse, and how they dealt with unresolved hatred. My own niece is divorced & "remarried" and she has been receiving communion for over 5 years across three parishes--although since she was raised to "not believe in" confession anyway (or the real presence) not sure how it matters except she calls herself and her family "Catholic". What constantly amazes me is the ability of you self-called faithful Catholics to constantly fool yourselves that something that ALREADY happened has not happened quite yet. Guess you will believe when you wake up in hell. Cardinal Burke’s response was classical Roman Catholicism. Measured, logical, compassionate. He emphasises that this document is pastoral, the personal reflections of Jorge Bergoglio on the work of the Synod; and not a solemn act of the Magisterium. He connects the repeated use of the word “ideal” (of Christian marriage) with Vatican II where this “ideal” is expressly taught as being within the reach of all of us. And the Pope’s exhortation does not propose doctrine, the Cardinal confirms. Instead, it addresses the messy day-to-day of our pluralistic society. He concludes with his own rather moving personal reminiscences, as a layman and as a priest, of those he has encountered who find themselves in challenging family situations in our increasingly pluralistic society. These reminiscences make it clear that he applauds Pope Francis’ attempts to grapple with these difficulties. But the indissolubility of marriage, he says, one man and one woman, has not changed. As you and others have said, there are commentators who have totally misrepresented the document – and Cardinal Burke’s robust defence of it. Let’s be clear, these people were always going to do that, because it fits their ongoing agenda. Your own post seems a bit schizophrenic but ultimately you have lapsed into default conspiracy-theory mode. The document will be a new Vatican II, you suggest, a commie plot. You see a red under every bed. Well, fifty years down the road, flower-power and communism have come and gone but the Church is still standing, nothing has changed. Keep calm and keep prayin’. Cardinal Burke comes into the ”don't panic“ category. The issues at stake here are too important and he realises that. He is not only being all the good things you things you have said about him, he is also being Catholic. The issue of canon law has been discussed recently. Related to it, I saw an article in the press last week which pointed out that in the UK, the law of Parliament is our defence against arbitrary and misguided government. I suggest canon law plays a similar part in Catholicism. Francis, whatever ones' opinion of him is, has come and will go. He is after all but one of 266+ Popes, who have varied somewhat. In two or three, “Pope times”, if I may use that expression, we will have another Council to sort out the present complete and utter shambolic mess, and then we can look amidst the wreckage for the Catholic Church and carry on again. Steady the Buffs! The problem is, it seems Cdl Burke sees AL as 0, nada, rien, nothing. As you say, it adds nothing. But if that were the problem, there would be no issue with it. But it is not 0, nothing. It is -100, it detracts. Not officially of course. Heck, Francis himself says as much - he never claimed to change "official magisterial teaching." Rather, he simply is changing practice, of course. That's all. Nothing to see. Like the speed limit that's never enforced, or the tax that has so many loopholes no one has to pay it, it's still "on the books" but applies to no one. A.L., is not a fallible document. Those commenters, always misrepresenting PF's documents by quoting their language! How nefarious! Always remember, and make no bones about it, "the devil is in the details" when analyzing AL. "Simple Fairy Wand: The document will be a new Vatican II, you suggest, a commie plot. You see a red under every bed. Well, fifty years down the road, flower-power and communism have come and gone but the Church is still standing, nothing has changed. Keep calm and keep prayin’." Excuse me? Maybe you didn't see the francis mess w/Che, Raoul & the cuban commies. Maybe you missed the fence mass, or the shoutout to the Italian Abortionist Communist, or Bernie Sanders, commie, being invited to the Vatican. Maybe you missed the eco encyclical worship flower mother earth. If you don't see the sodomites, pedophiles, baby murderers and adulterers receiving communion at mass--and if you do see them and think that is "nothing's changed" maybe you should join cardinal burke in stormin heavin w/prayer by saying your rosary once a month--next date is MAYDAY.